A track will be built on the equator, so something like a round railway will be constructed. It’s flat, so mountains on the equator will be flattened. Part of the seas/oceans will be reclaimed. It’s almost frictionless, so wheels can move on it easily. A similar track will be constructed on the Moon. Solar panels are placed on the Moon, covering over 90% of its surface. The remaining area is used for maintanence, as well as the track. A thick (perhaps, really thick) wire is constructed, perhaps with the help of airplanes, satellites and space shuttles, so that the tracks on the Earth and the Moon are connected. The wire may look like a thick pole when viewed on Earth, but when we scale down everything it should look only something like a set of electrical wires. At the two ends, wheels are installed, so the wire can move on the track like a train. All materials used conduct electricity (perhaps with a plastic coating if there’s any safety concern). All countries are going to work together, so money is (probably?) not a concern, and selling electricity earns money anyway. All countries have the responsibility to maintain the system. I assume that no one deliberately damages the system. Flying organisms around the wire are monitored, so they will be killed or brought away before getting close to the wire. It’s up to the civil engineers of this project to decide the details of the system, for example, how wide the track should be, how thick the wire should be, etc. All of them are well-educated. There is no aesthetic concern, so it’s okay for the system to look ugly as long as it supplied electricity. Is this feasible? Any practical difficulties that we are unable to overcome? Maybe not in 2050-2060 and not according to your design, but yes, it is possible to connect the Earth and Moon using scientifically plausible methods. The main stepping stone to this project would be building practical Space elevator. This will get us a "wired connection" from Earth to at least a geostationary orbit (35,000 km) altitude. Second step would be building similar elevator on the Moon. According to this answer, "moonstationary" orbit has an altitude of 52,700 km. Those two elevators are still way short of the average distance of about 385,000 km between Earth and Moon. Creating a free wheeling platform will be another engineering challenge. The original design with sea level rails around equator is not very practical, because, as L.Dutch had pointed out, rail platform will need to travel at supersonic speeds, and there would be no way of concealing it in some sort of hyperloop-type structure. That's why I'm proposing lifting this construction in space. This will be very similar to an Orbital ring, and platform would be able to move freely outside of thickness of Earth atmosphere. Next challenge would be connecting the wheeled/maglev platform with lunar tether. As we see from an orbital configuration scheme, we just can't connect Earth and Moon with a tightrope. So, the cable that connects Earth's space loop platform to lunar stationary tether need to have some slack. The distance between Earth and Moon varies between 360,000 km and 405,000 km. Subtracting space elevators lengths, space cable length has to vary between 272,000 km and 317,000 km (or less, because space elevators counterweights would be at higher elevation than geo/moon stationary orbits). Earth/Moon orbital configuration mismatch should add no more than 1,000 km to the estimated length of the cable. We either will have some 45,000 slack of the cable floating in space, or design "spooling stations" which would be pulling and releasing cable as needed. In real life, we can't put a metal pole between the Earth and the Moon. The end of the pole near the Moon would be pulled toward the Moon by the Moon's gravity, and the rest of it would be pulled back down to the Earth by the Earth's gravity. The pole would be torn in half. The Moon doesn't always stay the same distance from Earth. Its orbit takes it closer and farther away. It's not a big difference, but it's enough that the bottom 50,000 km of your fire station pole would be squished against the Earth once a month. 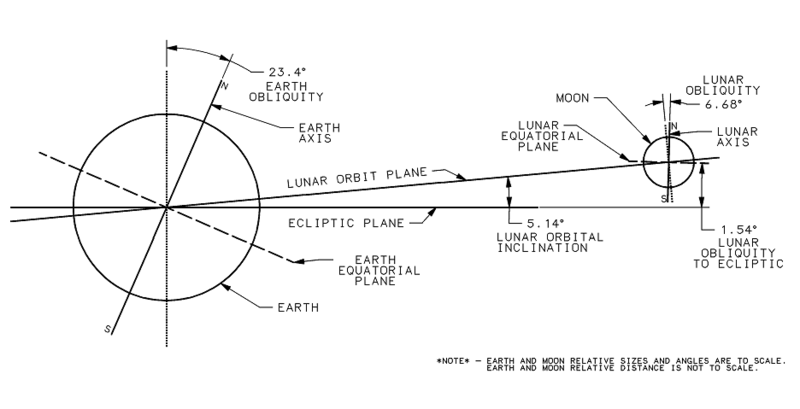 The Moon's orbit is tilted by about 5° relative to the Earth-Sun plane, while the Earth's axis is tilted by 23.5°. This means that the Moon's latitude changes the way the Sun's does, moving from the northern tropics to the southern tropics twice a year. Asking how fast the pole is moving relative to the surface is effectively the same as asking what the "ground speed" of the Moon is. This is tricky to calculate, because the Moon's ground speed varies over time in a complicated way. Luckily for us, it doesn't vary that much, it's usually somewhere between 390 and 450 m/s, or a little over Mach 1, so figuring out the precise value isn't necessary. So, in your concept you have a 380,000 km long pole moving at Mach 1 on a trajectory which moves constantly around the Equator and has also to accommodate for the variation in distance between the Earth and the Moon. If you want to transmit energy from the Moon, better invest in microwave (or any other EM waves for which our atmosphere is transparent) focused beams which is less sensitive to the listed problems. Instead of a wire, use a LASER and a receiver. They coulds still be gigantic constructions, serving the same or at least a very similar Story-purpose as a big wire. No one seems to have addressed the manifold issues with attempting to transmit electrical power over such a distance. First, you can't transmit electric power with only one cable, you need at least two. Modern transmission often uses three or more. The cables could be almost impossible to produce. It has to be strong and it has to conduct electricity very well - at such lengths, every nanoOhm of resistance adds up to a huge amount. It also has to handle extremely high voltages/impedances. The cables would certainly have to be very thick, and they would be very expensive. Frankly, I can't imagine how any material could be made that would withstand the forces this cable would endure, and for such a material to also have a low electrical resistance seems beyond belief. Suppose we have magic cables and there are only two of them. Likely HVDC (high voltage direct current) transmission is the only feasible option. Luckily this means no conversion at the source, since solar panels produce DC current. We will forget about conversion challenges on Earth on the assumption that they could be overcome if the cable could work. In order to make the transmission at all effective, a very high voltage would have to be used on the transmission cable, and a lower voltage would be present on the return cable. As an old radio engineer once told me, "at 10,000 Volts, everything is a conductor". The point being, putting "plastic" on these cables would do nothing to make them safer. They would have to separated by a decent amount of air for the earth-based portion, and some space in space. Likely they would have to have spacers made of some kind of ceramic between them to keep them the required distance apart for such a long distance. Now you have a huge cable with kV of electric potential in it circling the globe at Mach 1. Keeping wildlife away from it would be ridiculous. The wildlife wouldn't have anywhere near the time to get out of the way. Hopefully they would learn to avoid the path of the cable very quickly. Getting back to electrical issues, the movement of the cable through the air at such a speed would cause it to heat up, increasing its electrical resistance which would cause more heating, but there would be no such effect outside of the atmosphere, so we have two sections of huge long cable that have very different electrical characteristics. Basically it would have to be two types of cable joined together somewhere around the altitude where the air gets a bit dense. I can't even imagine the challenges of such a joint. The amount of the Earth's surface that would have to be used for cable track and safety margins is probably great enough that a better option would be to just cover that much of the earth with solar panels! Is a physical connection actually necessary? If you were to build a huge wire system along the lunar plane, why not make the wire system all coated copper wire. Then you install an incredibly powerful magnet on the moon. With enough copper wire you could make a whole lot of DC electricity just from the motion of the moon itself. While being a somewhat elegant way to generate electricity, The questions of how to construct such a powerful magnet, and where to get that much copper (there's probably not enough on earth) would still be major dilemmas. Ignoring the other problems that other answers have covered, I'd like to mention a couple of problems that haven't been talked about. 1) Friction: You said that you'd somehow have a friction-less track. Even if this were a hover train or you somehow reduced friction to near zero with wheels, wind resistance would be a major problem. You would have a train going around at about mach 1 (the speed of the moon) on this track. It might take much of the power being sent just to maintain the velocity of the train. 2) Electricity transportation over long distances. This is sort of the same type of resistance problem as above, but with electricity. Google "problems transmitting electricity over long distances" to learn more. Even over short distances energy can't just go through wire without losing some of its power, mostly in the form of heat generated and being dissipated. You could overcome these resistance problems with some sort of magic-wand waving fictional thing. Even better than ignoring those problems would be to mention the problems and either how they were solved or accounted for, or else have them be a real problem that affects the plot, if only in a small way. For example, the atmosphere of earth becomes increasingly hot because of the energy being dissipated from the wire. Or, because of the friction not being quite zero, over time the moon and earth's orbits are actually altered somewhat, and that starts to cause problems. Your premise that all fossil fuels will be gone by 2060 on earth seems maybe the most far fetched. Also that you can somehow build all these solar panels and two huge tracks and ship most of it to the moon in just a 10 year period. If your premise was that earth figures that they only have 300 years of fossil fuels left, (I'm just making up a number that's more believable, I have no idea the real number, which you should actually research), and they somehow all come together in a coalition to solve the problem for their children's children's children's children (again, very unbelievable), it would actually take up all those fossil fuels to build this stuff. Solar panels don't get created without using fossil fuels. Big tracks don't get created without fossil fuels. It would be an earth-altering project for sure (and pretty unbelievable). It would all be much more believable on a distant earth-like world. You could fix all sorts of problems that way. You could have their moon(s) be in the proper orbit, you could even reduce air resistance and gravity and all sorts of issues by not having your story take place on earth. Even put the civilization on a moon and have the orbiting power be satellites or other small harvested asteroids or moons. Make it enough like earth so that people identify with the characters and issues, but less like earth so you can fix all the scientific problems. The key is to recognize that there are definitely problems and not just ignore them completely. That doesn't mean the problems have to be front and center in your story, but if they aren't addressed a little bit then it isn't believable. The real question is what energy source are you getting on the moon that you can send back to the Earth? Solar isn't really viable because you still have light and dark phases. You'd just make solar satellites that get light 24/7 and beam the light back to Earth at the poles. If you want your wire to space, just have it as an space elevator that collects the H3 sent from the moon. Your plan is going to fail. The distance between the moon and the earth is not fixed and nor is the spot of connection. If you really want to build upon this approach, a more feasible solution will be to build a system of solar panels in space facing the sun. There will be 100% utilization of solar panels in this system rather than 45% since only half of the moon faces the sun at one time. You don't need to make a pole as long as moon distance. You just need to take them high enough to leave the earth's atmosphere so that you don't have to deal with air resistance. You may have to counter celestial gravity and space debris though. Don't worry about physical limitations or impracticalities. This is fiction. It doesn't need to be a blueprint for something in the real world. It only has to be enjoyable and understood by the reader. Go with a physical link, if that's what you want. Or use a wireless link (think Tesla Tower or shield generator from Endor to the Death Star). If all science fiction required a solid and feasible grounding in fact then we wouldn't have many science fiction books/films to enjoy. Not the answer you're looking for? Browse other questions tagged reality-check electricity metalworking or ask your own question.